Rather than arguing with them, I stood up, took an old receipt out of my wallet, ripped it into four pieces, and wrote a different word on each piece. Then I crumbled the pieces into little paper balls and handed a different piece to each one of them. The kids looked noticeably confused. “Look at the word written on the paper I just handed you and don’t show it to anyone else.” The kids followed my instructions and then glared back up at me. “You have two choices,” I told them. “If your word inspired you to make a difference in this world, then hold onto it. If not, give it back to me so I can recycle the paper.” They all returned their words without hesitation. The four kids just shrugged, but they struggled to appear totally indifferent, so I could tell they were listening intently. “And what’s true for words is also true for people,” I continued. “One person without help from anyone else can’t do much to make a sizable difference in this crazy world—or to overcome all of the various forms of repression that exist today. But when people get together and unite to form something more powerful and meaningful than themselves, the possibilities are endless. “What do you mean?” I asked with a smirk. “So, the sum of the two horses working together actually multiplies each horse’s individual payload power?” I asked. Why did I just share these stories with you? Sometimes we all need to be reminded of the power and beauty of working together. As Helen Keller so profoundly said, “Alone we can do so little; together we can do so much.” There is immense power between us when we combine forces to work toward a common goal. Teamwork is everything! All together… we are infinite! If you’re feeling up to it, I’d love to know what you think of this essay. 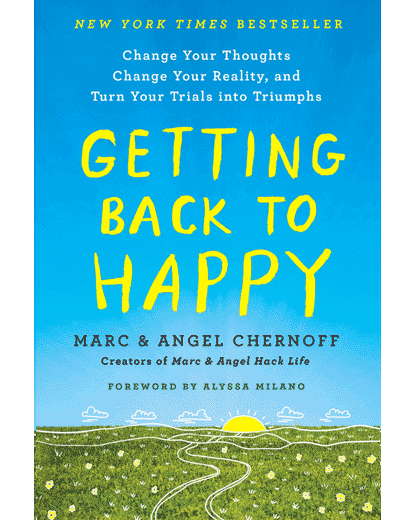 Also, our New York Times bestselling book, Getting Back to Happy: Change Your Thoughts, Change Your Reality, and Turn Your Trials into Triumphs, is now 43% off on Amazon! It’s the biggest discount we’ve seen. Click here for 43% off! It’s stories like the ones you’ve shared here today that keep me coming back to your live events and reading your blog and books. I think we all “know” a lot, but you tell stories that give me the perspective I need to take clear action. With that said, I really like how you got involved with those teenage kids. Most people wouldn’t say such things to others, due to one fear or another, but you just get your message across. And then I love how you connect the dots to your next conversation with your friend about her horses. Regarding the message, I completely agree today too. Those who accept that they are nobody become nobody, and those who accept that they are somebody become the somebody who has a big impact on how some system or subsystem functions. Teamwork really is everything! I can really identify with two horses pulling three times as much as one horse by itself. I have ADHD and have difficulty getting started. When someone is with me and gets me started I can get tremendous amounts of work done. What a wonderful way to savor daybreak by reading these inspiring words! And the real kicker is that I read a couple pages of your book just before I found this essay in my inbox. Thank you so much for who you to do to open the eyes and minds of others. We are fortunate to have the toolsof the modern age) to be able to become agents of much needed change. The world of tomorrow is going to be so much different than the one we grew up in. As a parent, I try to pass on what I believe will be of enduring value. But I also realize that realities are rapidly changing, and what we consider wise and prudent might not appear so to our kids as they become young adults. What will remain will be the unchanging principles of respect for life, compassion, love, and the realization that we are moving towards a shared destiny. Thanks for sharing this inspirational essay, Marc! The stories deeply resonate with me right now. I wish I had run into you when I was in high school, but I’m glad I can follow your site and be a student in your Getting Back to Happy course at 37. The work you and Angel do has been very encouraging and has changed my life a lot over the past year. Thank you. I felt just like the kids in your post. I, too, learned about MLK and his speeches back in high school. I, too, had a dream of changing the world. And as of late, this dream has been buckling under the weight of reality. But, guess what! Your post has inspired me; it’s no longer “had a dream” but “still have”. Thank you Marc and Angel, truly. The essay was great and reminded me that I can’t do it all by myself, and that with a team I can get much more done. Teamwork makes the dream work and I have to believe in myself more and not be scared to let people in in. You and Angel are such a positive force in our world. Thanks for the all the help you’re giving to everyone. I always read and save yours and Angel’s emails. While reading your story I started thinking about our new Science of Spirituality Meditation Center we just built in Lisle, IL. I have been meditating for 47 years now and I couldn’t believe how spiritually charged the Center was when we all meditate together. There is such a peaceful atmosphere because everyone is there to focus on developing spiritualy and become consciously aware of who they really are. There is definitely strength in numbers. It’s supercharged! So true. Several years ago my best friend was battling stage 3+ breast cancer. She came to me because she noticed there were very few male patterned chemo pillows. Could I make some? So I started and realized what I could make would make no impact. I put a note in our church bulletin, 14 women showed up, Wrangler donated fabric from their shirt line and we got to work. Now, 10 years later, we make pillows for the Cancer Center and Hospice, adult bibs for nursing homes pillow cases and pillows for Brenner’s Children’s Hospital, bibs, burp cloths and blankets for women who have nothing. We work strictly on monetary donations and money shows up just when we need it. Ironically, I’ll be making a chemo pillow for my husband because he’s just been diagnosed with stage 4 lung cancer. It’s come full circle. We’ve been there for each other through hard times and bad. Now, they’re there for me. It’s a great group. One woman drives 22miles because she said we’re such a happy group. There’s so much more to this group, but one could do so little but as a group we can do so much together. That’s the key—together! YES!!! This is everything! I love anything Martin Luther King Jr., Marc and Angel, and teamwork – this is the perfect mashup! 😍 Sharing with my teams today! Like relationships. I can’t “do this relationship alone,” I need my partner. If I trip and you are beside me, I foresee a 50% chance you might catch me from falling. Alone, I would fall. No foreseeable rescue. Carrying the weight of the world, we can all give someone else that 50% chance at whatever it is they are in need of. If we don’t offer up our hands, the world works alone and we may fall. It’s like being at a function, the band is playing. There’s a dance floor, but no ones dancing. Then, one couple dares to “not care who’s watching,” proves their devoted love to each other and they get up and dance. Before you know it, that encouraged others to also get up and dance. In this life, we don’t succeed without each other, some how. Some way. Thanks again for spinning the cogwheels in my mind and making me think. Pardon me for throwing in some of my cents here… Angela, even if you did the wrong thing, nobody has the right to blow up at you, for any reason. I don’t profess to know a lot, but just from your comment there it sounds like she’s throwing tantrums, and you won’t pull her up for this inappropriate behaviour. Forgetting you for a minute and the way she’s treated you – but for her sake, don’t you think it’s better for her if she gets pulled up now by someone who loves her unconditionally, so she doesn’t do this to other important people in her life, and turn relationships toxic? If I were you, I would be confrontating her with her behaviour, not apologising for wanting to organise your day. It’s perfectly reasonable and usually what considerate adults who care about one another do… regardless of the reasons, there’s never a good reason to treat someone else badly. Now I know I can’t really do it alone, I need a mate to enhance great success. Thank you, Marc, for such a life changing essay. Your essays have been thus inspiring. Keep the good work, more grace. Great reminder to Be the Change you want to see. Thank you! Thank you for your continuous wisdom that resonates from within. I look forward to reading your words and inspiring stories daily. I pass them onto my husband as he is my team player in life. Nice story! Keep it up! I love your story and is truly inspiring! However, even when trying to work as a team, there is always ONE person who refuses to work together. He/she would rather sit in the corner and not be a team player. Despite all your efforts to show what the end result would be or to include him/her in the process, still would rather be alone. What do you do? Hi Leigh, I just had to comment on your reply. Years ago my employer sponsored a teamwork seminar which included a task where the attendees were divided into four groups and each group was tasked with finding consensus around whatever their goal was. The groups were then re-mingled and again tasked with finding consensus. This happened four times and all four times the group with one certain individual in it could not reach consensus and all other groups could. Knowing that employee it wasn’t a surprise but I’ve often thought about that and asked the same question, what do you do? If someone doesn’t want to be part of the “team”, should we allow them to work alone and find tasks accordingly? I guess part of it would depend on what your goal is and how important is it to include them on the team? Thought provoking question.